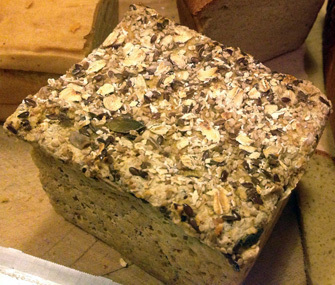 Gluten free loaf with mixed seeds. Delicious and crunchy and full of goodness. Ingredients: Polenta, oats, linseed, sunflower seed, pumpkin seed,sesame seeds, brown rice flour, tapioca flour, fresh yeast, xantham gum, sea salt. 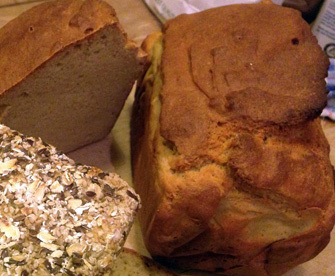 Gluten free loaf with a nutty flavour and enriched with eggs, milk and butter. Ingredients: Brown rice flour, buckwheat flour, tapioca flour, gram flour, baking powder, eggs, honey, milk, butter, xantham gum, sea salt. These loaves are made by order only. For more details or how to order, please contact Tom or Pavlina.